This year’s Christmas cake hits all the right buttons! After polar bears, penguins, robins and melting snowmen…I was looking for a new idea. I found this pretty scrapbook Christmas card on Pinterest and inspiration hit! Marzipan and then cover the cake in white fondant icing. Roll a narrow trunk from chocolate fondant icing and roll thin branches, six each side, stick them to the iced cake by brushing on water with an artist’s soft paintbrush. Use whatever colour fondant icing you desire for your buttons. 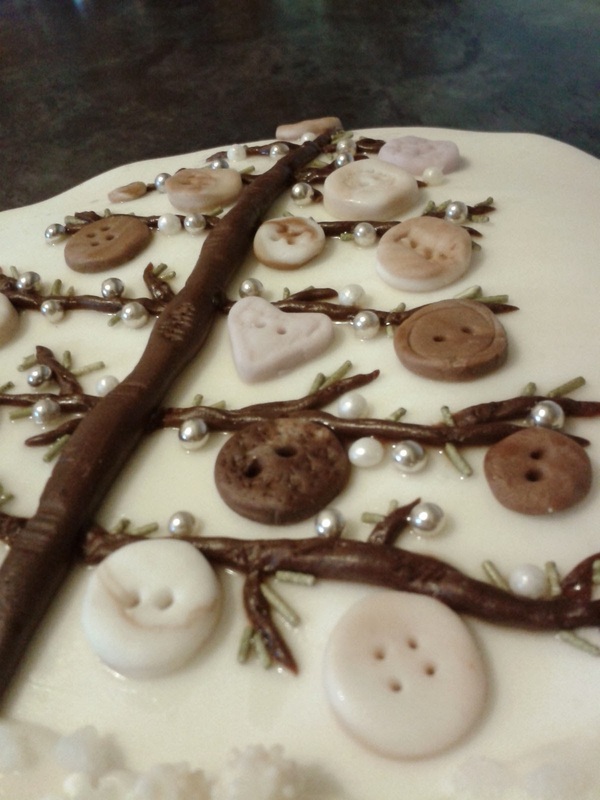 I wanted natural coloured buttons, so mixed white fondant with brown and added a couple of lilac buttons. 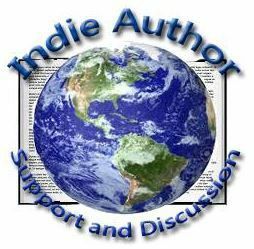 Follow instructions here to make your buttons (Pinterest is so useful!) In case the post is ever removed…roll fondant then cut out buttons using a tiny circle cookie cutter or the end of icing tips, add the holes using a cocktail stick, then decorate pressing the star end of icing tips against the buttons, or pressing a fork onto them, or indenting with whatever pattern you like. Add your buttons to the tree. Add small twigs, rolled from chocolate fondant. Gently mark the trunk to make it bark-like. 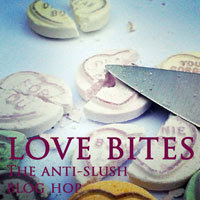 Add green sugar strands, use tweezers to pick them up and a cocktail stick to gently manoeuvre into place. Make Royal icing and spread across the bottom of the cake and down the sides to make a snowy base, and add whatever sprinkles you wish. I added shop bought sugar snowballs, ice, silver balls and snowflakes. 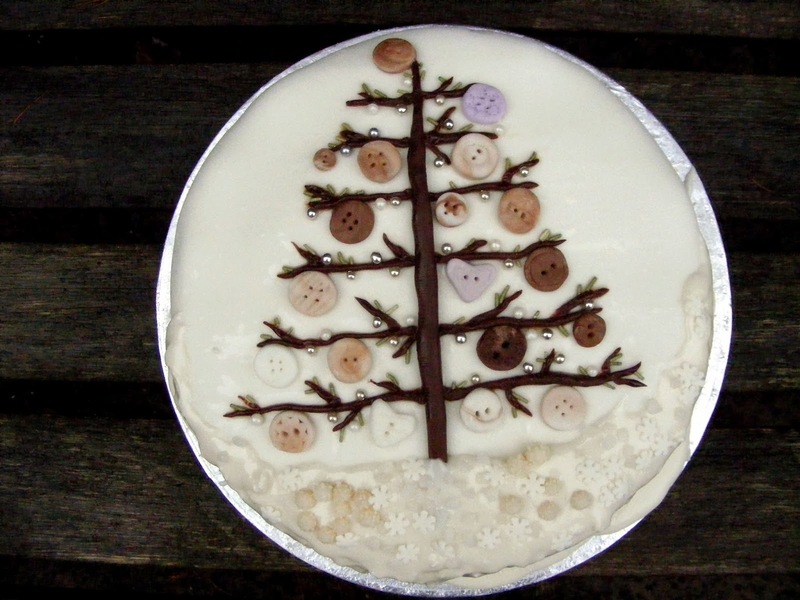 Thus…a lovely Button Christmas Tree cake. I always decorate the cake on my own and we have a small family competition to guess what they’ll find on top. The children made guesses, and came close, but this was pretty original! In case you’re interested, these are the past years cakes…now to start pinning ideas for next year on my secret Pinterest board! How are you decorating yours? 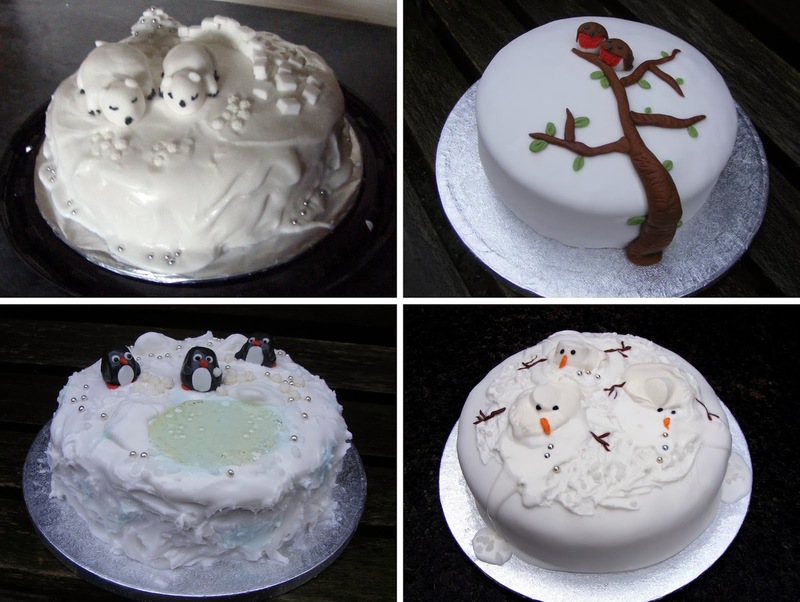 This entry was posted in DIY and Craft and tagged Button Christmas Tree Cake, Buttons, cake, Christmas, Christmas Cake, decorating cake, fondant, icing on 19th December 2013 by Lisa Shambrook.